The auxin/indole acetic acid (Aux/IAA) genes encode a large family of short-lived proteins that regulate auxin signaling in plants. Previous attempts to understand the role of auxin during fruit development in peach (Prunus persica) found that expression of the Aux/IAA gene PpIAA19 was upregulated during fruit ripening, but the biological significance of the PpIAA19 protein is still unknown. The current study detected PpIAA19 transcripts in all peach plant tissues but found higher levels of accumulation in fruit S1 and S4II stages. During fruit ripening, the expression level of the PpIAA19 gene in melting flesh (MF) peach fruit was unsurprisingly higher than in stony hard (SH) peach fruit. Tomato (Solanum lycopersicum cv. ‘Micro-Tom’) was used as a model for investigating the phenotypic and molecular changes associated with over-expression of PpIAA19. 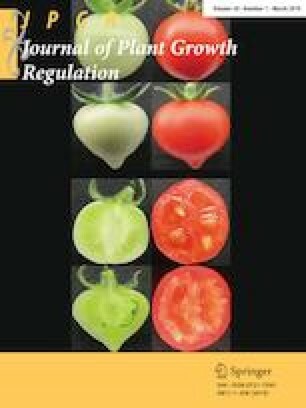 This revealed that PpIAA19 was involved in regulating tomato lateral root number, stem elongation, parthenocarpy, and fruit shape. Molecular analyses of transgenic tomato plants over-expressing PpIAA19 indicated that the observed phenotypic changes were partially mediated by regulating the expression of auxin response genes. This result extends the functional characterization of PpIAA19 in tomato, and broadens our understanding of the role of auxin signaling in regulating plant growth and development. Yifeng Ding and Wenfang Zeng have contributed equally to this work. The online version of this article ( https://doi.org/10.1007/s00344-018-9813-z) contains supplementary material, which is available to authorized users. The research was financially supported by the National Natural Science Foundation of China (No. 31501732), the Agricultural Science and Technology Innovation Program (ASTIP) (CAAS-ASTIP-2018-ZFRI), and Central Public-interest Scientific Institution Basal Research Fund (1610192017103). WZ and ZW conceived the experiments; YD, XW, and YW collected plant materials and conducted the experiments; LN, LP, ZL, and GC performed phenotyping; YD and WZ analyzed the data; and WZ, GL, and ZW wrote the manuscript.